Click the “Replace All” button. That’s it. Every occurrence of “millenium” will be replaced with “millennium.” Simple and quick. But wait—there’s more! Microsoft Word provides many ways to refine your search. See the “More” button at the bottom of the “Replace” dialog? Wildcards are important, but in this article we’re trying to avoid these. For explanations and examples, see my past articles (e.g., Lyonizing Word: From Easy to Impossible — Three Variations on a Theme, Lyonizing Word: The Easy Way, Not So Easy, Lyonizing Word: The Easy Way, Not So Easy, and Lyonizing Word: We Can Do This the Easy Way, or . . . ; if you use EditTools, see The Business of Editing: Wildcarding for Dollars). Please note, however, that if this option is checked, you can no longer select “Match case” or “Find whole words only.” Even so, during a wildcard search, “Match case” is automatically enabled, even though it’s not shown as enabled (an oversight on Microsoft’s part). “Find whole words only,” on the other hand, is inactive. This option finds words that sound like the word in the “Find what” box. For example, if you search for “cot,” Word also finds “caught.” If you search for “horse,” Word also finds “hoarse.” This could be useful if you’re working on a document in which certain words have been confused or mistyped. Basically, this feature works on words that are homophones; it doesn’t seem to work on words that sound almost alike, such as “horse” and “whores.” On the other hand, while searching for “horse,” it also finds “horsey” but not “horses,” so who knows? This option finds what Microsoft calls “all” forms of the word in the “Find what” box. For example, if you search for “sit,” Word also finds “sat” and “sitting.” The word “all” is a little misleading, however. The feature relies on an underlying database of word forms that is pretty good but has some omissions. For example, if you search for “eat,” Word finds “eat, “ate,” “eaten,” and “eating” but not “eater.” Similarly, if you search for “horse,” Word finds “horse,” “horses,” and “horsing” but not “horseless.” It’s a useful feature, mostly for finding verb forms; just don’t expect it to actually find all forms of a word. This option matches words beginning with the search string. For example, if you put “pre” in the “Find what” box, Word finds “prepare,” “present,” and so on. This isn’t a “smart” feature; it searches for characters only, not word roots. For example, searching for “pre” also finds “prestidigitation” and “pressure,” even though “pre” isn’t really a prefix in those words. This option matches words ending with the search string. For example, if you put “ing” in the “Find what” box, Word finds “singing,” “typing,” and so on. This isn’t a “smart” feature; it searches for characters only, not word roots. For example, searching for “ing” also finds “boing,” “spring,” and “thing,” even though “ing” isn’t really a suffix in those words. Ignores punctuation characters between words. For example, “trees plants and flowers” finds “trees, plants, and flowers” as well as “trees plants and flowers.” This might be useful for fixing problems with serial commas. Ignores all white space (spaces, tabs, and so on) between words. For example, “webpage” finds “web page” as well as “webpage.” This is the inverse of “Find whole words only” and could be useful for fixing words that are sometimes spelled open and sometimes closed. If you’re working in a language other than English, other options may be available, including Match Kashida, Match Diacritics, Match Alef Hamza, and Match Control. I know almost nothing about these options, so I can’t comment on them with any degree of expertise. 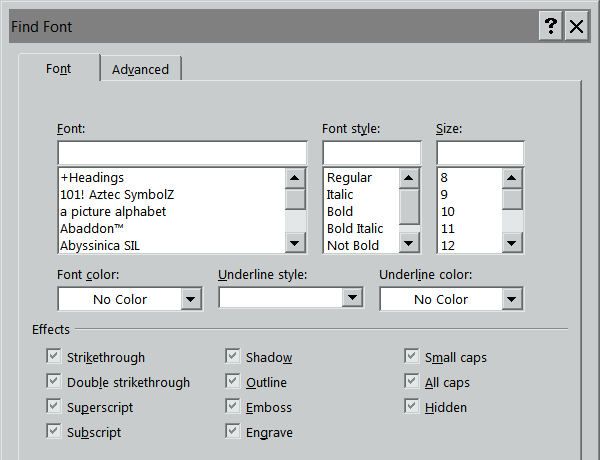 Now Word will find text in italics but not in roman. If you also enter a word, you’ll find that word in italic but not in roman. If you don’t enter a word, you’ll find anything formatted as italic. But what about the “Replace with” box? What happens if you use formatting there? If the “Replace with” box includes some text, whatever is found will be replaced by that text in the format you specified. If the “Replace with” box doesn’t include text, whatever is found will be replaced with itself in the format you specified. For example, if you search for the word “apples” to be replaced by “pears” in bold, that’s exactly what you’ll get — “pears” in bold. If you search for the word “apples” to be replaced by bold alone (with no text), you’ll get “apples” in bold. If, on the other hand, you search for “apples” but don’t specify text or formatting in the “Replace with” box, “apples” will be replaced with nothing; in other words, it will be deleted. Note that you can also specify not a certain kind of formatting, such as “not bold” or “not italic” in either find or replace. You can also use combinations of formatting (and “not” formatting). For example, you can search for bold but replace with italic and not bold, which will turn any bold text into italic (but not bold italic) text. In addition to all of those options, Microsoft Word includes lots of built-in find-and-replace codes that are not wildcards (although lots of people call them that). 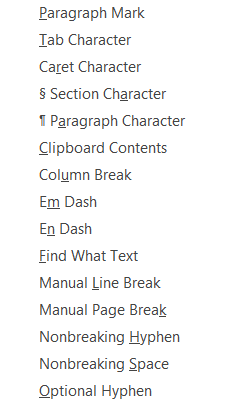 You can use these built-in codes to search for things like paragraph breaks, tabs, section breaks, column breaks, dashes, footnotes, endnotes, graphics, and many other things that aren’t actual text, and codes are a whole lot easier to use than wildcards. In fact, codes should be your default tool; you should use wildcards only when built-in codes won’t do what you need (which is actually fairly often, unfortunately). 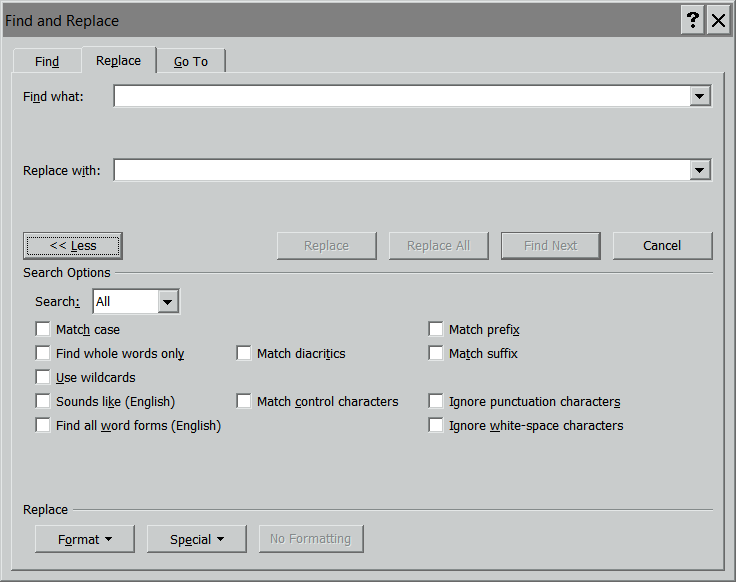 Some of Word’s built-in codes can be used only in the “Find what” box; others can be used only in the “Replace with” box. Some of the codes can be used in both boxes. To see the codes that can be used in the “Find what” box, put your cursor in the box. Now click the “Special” button at the bottom of the “Find and Replace” dialog. That tells Word to find a paragraph break — that is, the end of a paragraph. That’s an extremely useful code, because ordinarily the “Replace with” box can hold no more than 255 characters. But using the ^c code, you can replace with anything that is currently copied to the Clipboard, which can hold many pages of text, graphics, or anything else. After you’ve worked with built-in codes for a while, you’ll find it easy to just type them in by hand. In the meantime, you can use the “Special” lists to insert them. You can also use combinations of codes. For example, you could search for tabs followed by paragraph breaks (^t^p) and replace them with paragraph breaks alone (^p). Even without wildcards, Microsoft Word’s find and replace features can do an awful lot — much more than you might think. You probably already knew how to use “Match case” and “Find whole words only,” but did you know about those other options? “Ignore punctuation characters” and “Ignore white-space characters,” for example, can be very useful in editing. Being able to find and replace formatting is essential, especially when using styles. 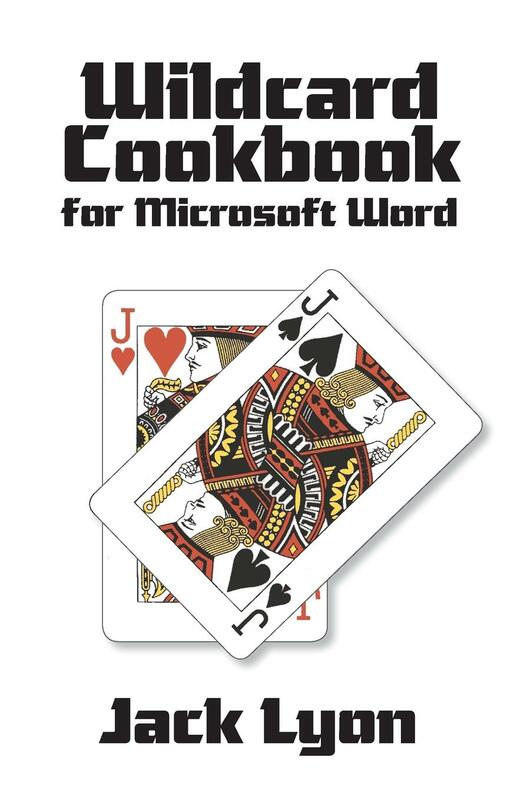 And using Word’s built-in codes lets you search for all kinds of things (graphics, page breaks, dashes, and so on) that would otherwise require more advanced techniques (like wildcards and numeric codes). In other words, Microsoft Word’s basic find and replace features aren’t so basic — at least not in what they can do!